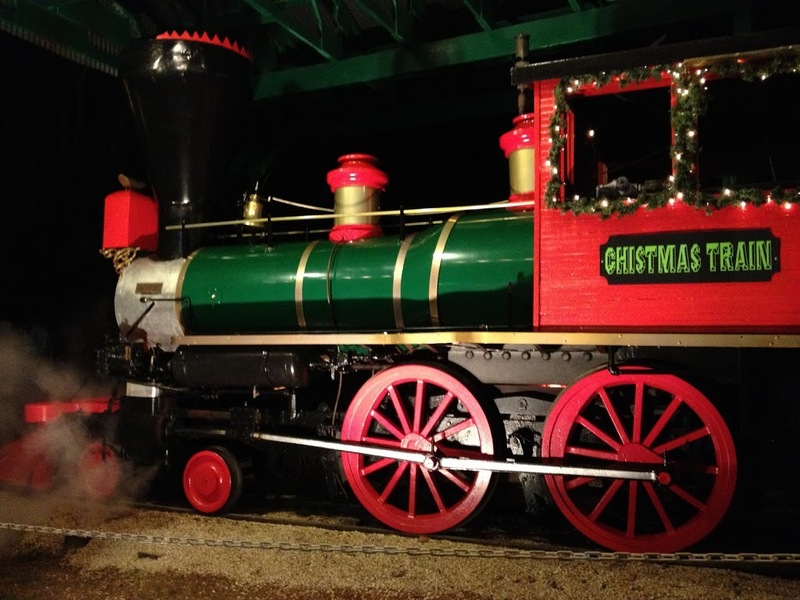 This past weekend David and I snuck away to take the best ever Texas Christmas Train Ride right here in Jefferson, Texas. 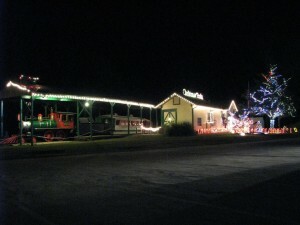 The train depot is decorated in a family fun sort of way. 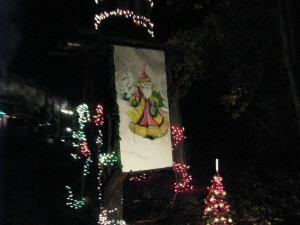 The walkway is lined with candy canes and the trees in front are all lit up with bulbs of every color, this year the train even had a nice fresh coat of paint on it. When you walk in to pick up your tickets Santa and Mrs. Clause are there to greet you. Then there was a candy and cocoa shop to take care of the hot-chocolate hunger you’ll have with the nip in the air. An Old Christmas Card on the water tower. We rode in one of the open cars so it did get chilly so bring a blanket to wrap around your legs and one for the seat wouldn’t hurt either. 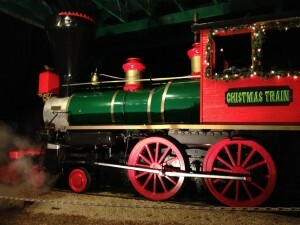 As the Christmas Train took off the steam rising in the cool crisp air was really a sight on the clear night. Riding along in the forest you’ll see sights such as large old Christmas Cards, lighted trees and even a live nativity deep in the woods. All the while Engineer Don sang Christmas carols and gave a wonderful narration of the sights seen along the way. The train will be running on New Year’s weekend with a very special celebration planned including fireworks. The depot is beautifully decorated. There are only a few weeks of rides left for the season; so don’t miss out get your tickets soon. 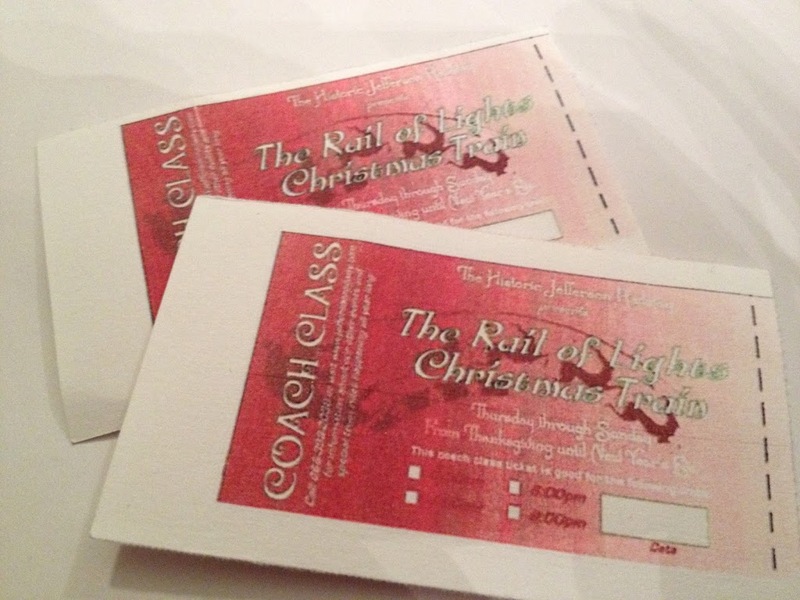 You can order them online at from Rail of Lights! This entry was posted in Christmas, Train Ride by Tammy D. Bookmark the permalink.